An awesome throwback not only to the original Star Wars trilogy, but the TIE Fighter PC game, and great classic science-fiction anime. Musical score: Zak Rahman, featuring “Interdictor.” Link here. 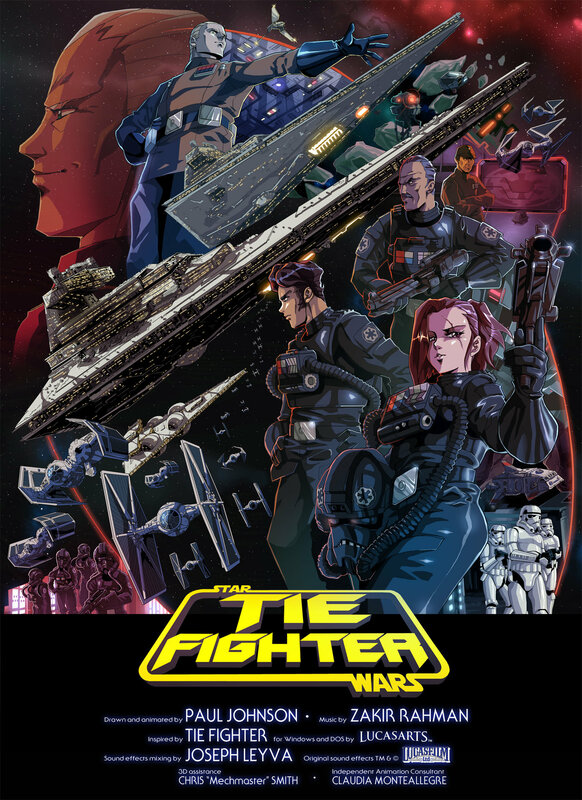 Synopsis: “What if there was an Empire-focussed short Star Wars animation, drawn with the crazy detail and shading of classic 80s anime that’s all but vanished from Japan nowadays?.” An awesome throwback not only to the original Star Wars trilogy, but the TIE Fighter PC game, and great classic science-fiction anime. Personal Thoughts: I have loved every bit of Otaking’s work since his awesome throwback to Doctor Who. Paul puts his heart and soul into his passions and fandom, combining great talents in both animation and production. Back in the day, I played Star Wars: TIE Fighter for the PC (released in 1994). I see the short out and glory for the Empire in respect for that game, a sort of propaganda film for the winning team. Here, the Empire portrays itself as sort of Intergalactic peacekeepers, weeding out the Rebellion vermin. The Empire commander (Gaunt) shows why he is paid the big bucks. But the hunt becomes not so easy, as the Rebels put up an honorable fight, with some intense rivalries put to the max. Yet in the end, all is futile. But until then, we see subtle reminders of why the Empire was most terrifying in the movie, Empire Strikes Back. It was those damn Star Destroyers. Their size and arrowhead shape reveals the power and ominous nature of the Empire’s extensive reach. The music strays from the original theme at times. Yet, it feels right as this the artist vision of the theme based on the game more than the movie. The original game had variations on the Imperial March theme as well. But the guitar rift them gives it a bit more energy and mind of its own, much like the animation. The animation is bleeding awesome with its fluidity and continual sequenced action. The details are crazy intense, right down to the cockpit buttons. The story needs no narration or words, as the animation tells so much with its detail, one doesn’t even need to familiarize oneself with Star Wars to appreciate. Meanwhile, the anime influence reminds me of the great classics involving intergalactic warfare including Star Blazers, Macross, Gundam, Legend of the Galactic Heroes, and many more. Furthermore, there are some major extra story details and info on a link Otaking provided – click here for that. Well worth a read, and greatly enhances the video presentation. Hats off to Paul Johnson for this, and a huge thanks. As much as I love his Doctor Who and Star Wars tributes, I would next like to see his next work to border on something totally original, bred 100% from his own imaginations. I would love to see more of his own concepts and then brought to life with his own great talents,, matching all the love he put into this. Or just surprise us, with more twists. I welcome any further work from the great Otaking. Paul Johnson’s original poster art, from his Deviant art page at mightyotaking.deviantart.com.. Thank you for prominently featuring Paul’s name in your post. There are tons of posting about this short film, and every single one has a headline that says “some guy”, “super fan” or “someone”. Paul must have put tons of effort into this, and obviously it is resonating with people, yet few bother to give him credit…so THANK YOU! I am a huge fan of Otaking’s work, and he deserves way more attention and praise for his extensive efforts. Yet, the amount of clickbait and disregard for the original creative talent astounds me as well. Im cheerful that we have ourselves, probably many more out there out there, also applauding the person behind the great work!